UN Photo/Eskinder Debebe. 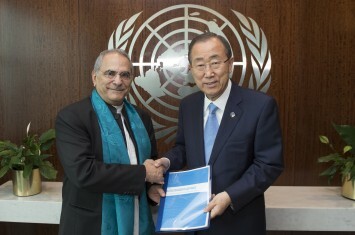 Secretary-General Ban Ki-moon (right) receives the report of the High-Level Independent Panel for the Review of Peace Operations, from the Panel’s Chair José Ramos-Horta, Nobel laureate and former President of the Democratic Republic of Timor-Leste, 16 June 2015. All peace operations are political. Ian Martin wrote an essay with that title in CIC’s first Review of Political Missions in 2010. It is unsurprising, then, that the report of the High-Level Panel on Peace Operations of which he has been a prominent member has the same starting point. When the United Nations intervenes, it is not using diplomacy and the threat of armed force in a vacuum: the goal is to stop violence caused by a struggle over power. The use of internationally mandated armed force, if at all necessary, is only one means and not the sole end of any UN peace operation. But what are the politics of this latest attempt to reform the way the world body addresses conflict? How should we understand this detailed effort to analyze the challenges of making peace or keeping it? What change are the words on paper trying to effect on the ground or at UN headquarters? And what are its chances of success? A brief survey of the world should make it clear these are urgent questions that need clear answers. The mission of the United Nations captured in the first line of its charter, reproduced on the front cover of the Panel’s report, remains as relevant today as it was when founded in 1945: the purpose of the UN is to save succeeding generations from the scourge of war. This is as much a challenge for the organization in 2015 almost 70 years after its creation. As the UN celebrates its birth on 26 June, it has more than 128,000 uniformed and civilian personnel in 39 missions. Peace operations flying under the blue flag or those of other groupings are undergoing a surge. Africa is the numerical center of gravity for peace operations, but they are also spread across the Americas, Asia, Europe, and the Middle East. Displacement, mostly caused by conflict, is at an all time high. Since the year of the landmark Brahimi Report released in August 2000, the numbers of those forced to flee their homes has more than doubled from 20 million to 51 million at the end of 2014. At the center of this massive movement of people is the intractable Syrian civil war, directly impacting the region and infecting the globe. It acts as a beacon alerting the people of the world to the impotence of “their” organization. This report in its substance and between its lines is firstly a story about the limits of the United Nations. It is a humble effort in a complex strategic environment. Uniting Our Strengths for Peace – Politics, Partnership And People is the formal name of the report of the High-Level Independent Panel on United Nations Peace Operations set up by Secretary-General Ban Ki-moon in October 2014. It defines these strengths broadly as activities that span from peacekeeping to special political missions, good offices and mediation initiatives. It makes the case for what it calls four essential shifts. First, it calls on the UN system to recognize that politics must drive peace operations. Second, it argues that the full spectrum of peace operations should be used more flexibly. Third, it makes the case for partnerships to be a greater part of the future. Fourth, it urges those in the Secretariat charged with implementing them to become more field-focused and people-centered. The report argues that change is required across four of the most important areas of UN peace operations: conflict prevention and mediation need to be remade a priority; the protection of civilians must be regarded as a core obligation of the UN; the use of force by UN peace operations and others must be clarified; and greater attention must also be given to sustain peace after an agreement has been signed or an election held. But more than “a call for change,” this report is a reminder of how many problems remain the same since the last big review. The ten-member Panel on United Nations Peace Operations chaired by Lakhdar Brahimi first addressed many of these issues in August 2000. It proved to be something of a blueprint for the former Algerian foreign minister. He had the opportunity to put his ideas into practice, especially the concept of the “light footprint” mission, as the Special Representative of the Secretary-General (SRSG) in Afghanistan. Re-reading the Brahimi report’s executive summary should be a pre-requisite before tackling the 321 numbered paragraphs of Uniting for Peace. The external and internal challenges for UN peace operations are uncannily similar. While not as revolutionary as Brahimi was in its time, this report does propose some new ideas for old problems. To be ready to act, a UN standing capacity was first proposed in 1948, but Member States have never embraced this idea. For decades, it has been lamented that peacekeepers take too long to deploy to UN operations. Brahimi proposed targets for rapid deployment of 30 days for a “traditional mission” and 90 days for a “complex one”. This has proved too demanding a standard for the system to meet. Uniting for Peace now advances the idea of a “small UN vanguard capability” to allow quick response to a new mission or provide reinforcements to an existing operation. These units could be deployed from a regional hub and equipped to be self-sustaining for three months. The cost of maintaining this strategic reserve could be shared by a group of missions, but once deployed their costs would be charged to the mission budget where they were sent. The Panel urges the Secretariat to come up with the plans to make this standby option a reality. 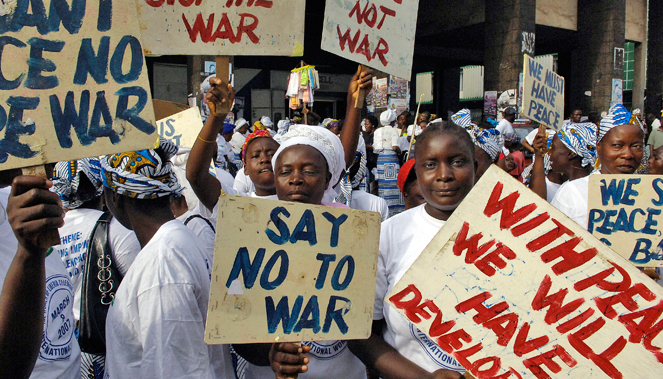 There is a real need to provide more support to African peace operations. A UN force can take time to be mandated and deployed. Regional countries can react more quickly to crises, but they face challenges providing long-term support to their forces dispatched to deal with conflict in their own neighborhood. 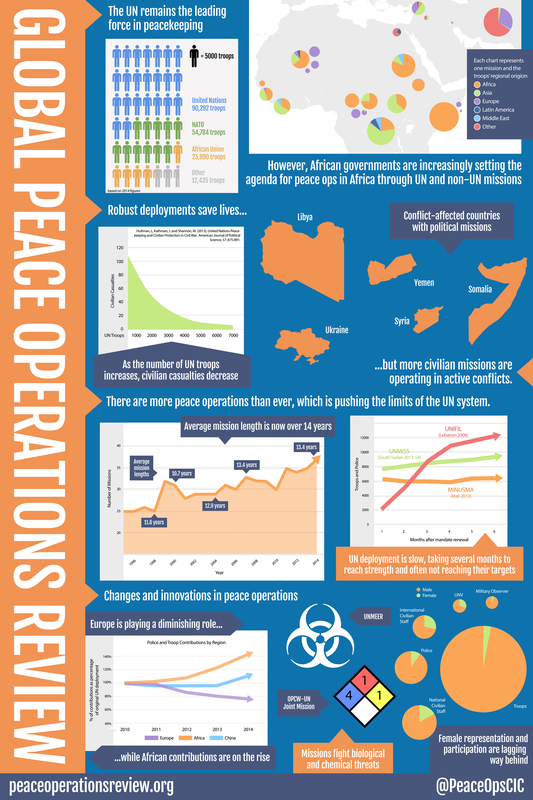 Data from the Global Peace Operations Review illustrates the scale of the problem and its possible cost if this idea is taken up. In 2014, more than 48,000 African troops served with UN missions on their own continent. Meanwhile, in excess of 36,000 troops were sent to take part in non-UN missions. Such arrangements in financing missions could lead to conceptual shifts. In many deployments, including in the UN mission in DRC and AU-led operation in Somalia, African contingents have been much better prepared to use force in robust operations than their South Asian comrades who are the biggest UN troop contributors. But shifting the burden onto AU troops by sharing the cost of deployments does not equal UN disengagement. Monitoring interventions derived and funded under such mandates will still be a challenge for the UN system, which puts a premium on the protecting of civilians, human rights, and preventing sexual abuse and violence. Uniting for Peace tries to draw a red line over the UN’s involvement in counter-terrorism operations: UN peacekeeping missions are not suited for such operations. They lack the equipment, intelligence, logistics, and training required. This is all true. But such a demarcation may be in vain. Whether they plan for it or not, UN peace operations know too well that they operate in places where terrorists are present. The organization once thought its impartiality would be its shield, but since the 2003 bombing of its Baghdad headquarters, the UN increasingly finds itself a target. The way this issue is framed in the report suggests that the UN Secretariat, its bodies and its Member States can choose whether to cross this line. But the challenge of countering violent extremism is not going away, particularly in large swathes of Africa, Asia and the Middle East. There is another dimension to the inability to ignore the problem: when it comes to peace operations, the organization’s real politik dictates that the Secretariat must go where the Security Council sends it. In another attempt to set limits, the Panel drives to make exceptions for offensive operations such as those in Somalia in 1993 and DRC in 2013. The report’s position is more like a red smudge than a clear line, perhaps illustrating differences of opinion within the diverse group of experts. A number of points in the report regarding mission needs and member state contributions, when taken together, should prompt a discussion about how to better match supply and demand. Should the UN Security Council scale back ambitious missions if troops cannot be found to staff them? Or should Western countries contribute more forces to present and future operations? African troops are already the major peace enforcers in Somalia and DRC. A Nigerian-led coalition recently confronted Boko Haram. Is the UN being bypassed for the hardest jobs on the continent? While not strangers to the system, the members of the Brahami and Prodi panels were more outsiders looking in than the sixteen “eminent personalities” of this latest body, many who have decades or, in some cases, entire careers working inside the system. Chairman Jose Ramos Horta, a former president of Timor-Leste, is one of the relative “outsiders,” but even he has been a beneficiary of one of the most successful series of UN peace operations that brought his country to independence and made it the 192nd member of the UN. After leaving national politics, Horta headed a UN political mission in Guinea Bissau. His deputy, Ameerah Haq, served in Afghanistan as a deputy SRSG before leading a later mission in Timor-Leste. Haq then served as Under-Secretary-General for the Department of Field Service (DFS), the UN headquarters group supporting all peace operations. This collective experience gives Uniting for Peace a level of bureaucratic detail not found in Brahimi. These insiders lived with the problems they are trying to resolve with this report. After a decade and half between reviews, the laundry list of required fixes is still lengthy. UN peace operations need improved analysis, planning and more realistic mandates. They need faster deployment, better administration and clearer communications with those communities they are sent to help. There are many changes that the Department of Political Affairs, Department of Peacekeeping Operations and DFS would like to do. But they are blocked from doing them, or simply have not yet got around to them. The report’s contents will not surprise those within the house. Such closeness can also be a weakness. For those struggling with lack of coordination inside the system, the proposal to create an additional Deputy Secretary-General position responsible for peace and security is a reasonable option. It is explicitly drawn from the Secretary-General’s High-level Panel on Threats, Challenges and Change in 2004, another review stacked with eminent people. The proposal is a peace offering, rather a declaration of internecine warfare that the revolutionary idea of a merger of DPKO and DPA would provoke. Rearranging the Secretariat’s organizational chart excites those who work in Turtle Bay, the New York neighborhood around the UN’s iconic headquarters. It means nothing to those who think it is a resort in Vanuatu. There are a number of such instances where the report does not seek to reinvent the wheel when it feels a good idea has been too long ignored. It calls on the General Assembly to adopt a 2011 report of the Advisory Committee on Administrative and Budgetary Questions (ACABQ) to, among other things, establish a separate account for the funding of special political missions. Such frequent references to older reports reflect poorly on the glacial pace of change at the UN. They also raise red flags about obstinate forces arraigned against systemic change. But Uniting for Peace has modest objectives. It is incrementalist, not revolutionary; more a notable milestone than a Brahimi-like landmark. In coming months, a joint team from the Secretariat will produce an implementation report providing some “low hanging fruit” for the Secretary-General in the twilight of his ten years in office. In September, the Obama-Biden peacekeeping summit will provide Ban Ki-moon with a ready-made platform to talk about the future of UN peace operations. If this report is to endure, then his successor will need to see some merit in its recommendations and adopt them as their own. There will be two other overlapping reports in coming months to digest: the Review of UN Peacebuilding Architecture, chaired by former Guatemalan Foreign Minister Gert Rosenthal, as well as the High-Level Review on Resolution 1325 on Women, Peace, and Security, headed by Panel member Radhika Coomaraswarmy. To assess whether Uniting for Peace might succeed will take time. It will also require a more comprehensive response from member states. As the permanent representatives in New York are never shy of pointing out, it is their organization and they are the ones running the show at the United Nations. Most crucial will be the P3 – the U.S., Britain, and France – who pay the largest share for peace operations. Other potential spoilers include the G77, particularly if they see the report as being too Western. African Member States pushed for the proposal to pay for their operations from the UN peacekeeping budget, but can they marshal the support of wealthy nations to pay for it? The Panel is attuned to the reluctance of Member States to pay more for peacekeeping. It makes a pitch that with the planned winding down of some peace operations through sequencing, its recommendations could be cost-neutral. But can the Security Council restrain itself, and will Member States buy this argument? In calling for change, the report urges others to act and uses many synonyms for the UN’s Member States including the Security Council, regional organizations, troop contributing countries, host countries, and the ever-amorphous “international community.” A reader is left with a sense that the report’s authors are disappointed with their relative inertia in the face of so many crises. “Member states have not sufficiently invested in addressing root causes of conflict,” the report says. “The protection of civilians is a national responsibility,” it notes. “Member States should provide the necessary resources and lend their influence,” it urges. The report treads a fine line between chiding and chastising. The panel is an advisory body and its recommendation can simply be ignored − but how will member states react if they feel they are being lectured to? Brahimi had something of this tone, too. “The Secretariat must tell the Security Council what it needs to know, not what it wants to hear,” is one standout line. “When recommending force and other resource levels for a new mission, … it must set those levels according to realistic scenarios that take into account likely challenges to implementation.” These strident lines were written when the world was unipolar and led by the Unites States, a simpler time that a senior Secretariat official describe recently as “a golden age of peacekeeping.” But we now live in a time of multiple centers of power. This is only a problem for those who got used to getting their own way. Those able to now veto or simply obstruct feel empowered. With the U.S. and Russia once again using the organization as a proxy battlefield, the “challenges to implementation” are numerous. NATO’s perceived over-reach in UN-sanctioned operations in Libya, for example, created the mistrust that has led to inaction in Syria. Then again, as Jean-Marie Guéhenno has written in The Fog of Peace, his memoir of peacekeeping in the 21st century, we still have not overcome the “lingering damage to the idea of collective action” caused by the 2003 invasion of Iraq. As a young man, Jose Ramos Horta was known from the 1970s as a fearless and blunt advocate for his country’s independence. He walked the corridors of the UN as an outsider for more than two decades. In releasing his panel’s report to the Member States, he sounded like one of those polite New York diplomats he once railed against, whose careers were made in meeting rooms. “We heard your call to reform not only the system’s instruments but also the mindset required to deliver them,” Horta said. But neither now nor a decade and a half ago is there a consensus among Member States that a more assertive, effective, or efficient Secretariat is a desired outcome. As he noted in the same speech, Member States and regional organizations made almost 60 submissions. In other words, the majority did not contribute. Without renewed commitment on the part of Member States, significant institutional change and increased financial support, the United Nations will not be capable of executing the critical peacekeeping and peacebuilding tasks that the Member States assign to it in coming months and years. In its modesty, Uniting for Peace may be laying the foundation for its own success. It is a practical technocratic document that has eschewed ideas that are too big or frightfully expensive. It is a sensible blueprint for what needs to change, and will be with us for some years to come. It can be a primer for the next secretary-general. But like Brahimi, the biggest challenge for Uniting for Peace comes with implementation. This Secretary-General and the next must be more leader rather than conference organizer. They will need to build a consensus among member states that these reforms are crucial for more efficient peace operations, and it is in their interests to support them. In this handover from one SG to the next, there is a window where change again seems possible at the United Nations. With the right leadership, the next report on peace operations can be less déjà vu and more a progress report.